HARGL O PERFORMANCE have been appointed the exclusive UK importer for KUBERG electric motorcycles. Electric power is increasingly popular for children’s bikes, as it creates no noise or fumes, the motors are virtually maintenance free and there are no kick-starts, gears or hot exhausts to worry about. Based in the Czech republic, Kuberg design their motorcycles from scratch, using rigid steel frames and 12V sealed lead acid batteries, which use proven technology to deliver reliable and inexpensive power. Designed for riders from 2 to 5 years old, the START weighs just 20.5kg. Its 500W electric motor has clutch-less direct drive and a parental speed dial control. Its 9Ah battery gives an hour’s riding time and recharges in 6 hours. The retail price is £750. For older riders (from 5 to 10) the TRIAL E has a more powerful 750W motor and 14Ah battery that gives up to two hours running time. With disc brakes front and rear, smooth linear power and excellent acceleration, this competitive bike sells for £1095. 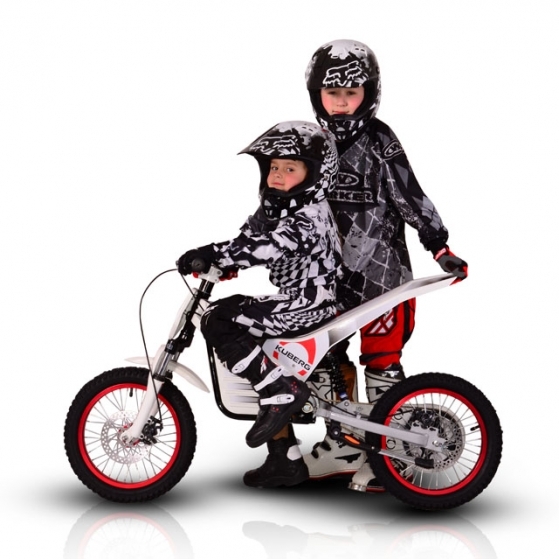 Kuberg’s CROSS is the world’s first electric motocross bike for 5 to 12 year olds. With a 750W motor, high quality custom made suspension and great brakes, young riders can enjoy the bike’s instant torque and incredible acceleration. RRP is £1195.